Biblio Researching: About That Engraving By William Kneass . . .
About That Engraving By William Kneass . 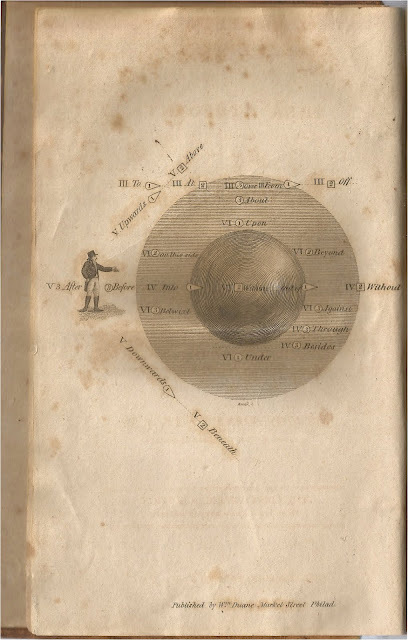 . .
Of note is the frontispiece of the first volume, an illustration of prepositions. It was engraved by William Kneass (1781-1840), who later became the Chief Engraver of the United States Mint, a position he held from 1824 until his death in 1840. William Kneass impressed me with the design of his engraving. 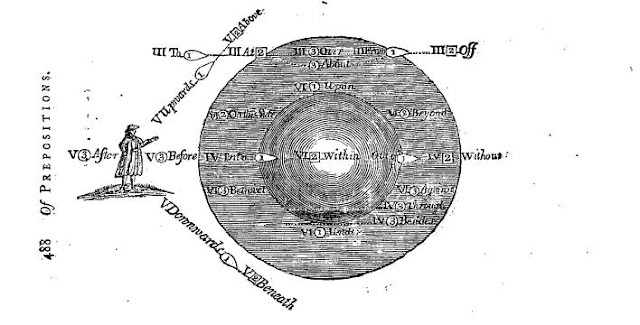 He pictorially defined the prepositions in a brilliant diagram. Here's an expanded view, with his last name and the abbreviation "sc," printed immediately below the circle. "Sc" stands for "sculptsit" or "sculpserunt." In layman's terms, the words mean "engraved by." In researching Kneass, I learned that numismatists at uspatterns.com "are of the opinion that there is not a single United States pattern coin design that can be attributed to Kneass." To me, this made Kneass's engraving in The Diversions of Purley even more noteworthy. The engraving is the front cover of a bookseller catalogue from the late 1980s. 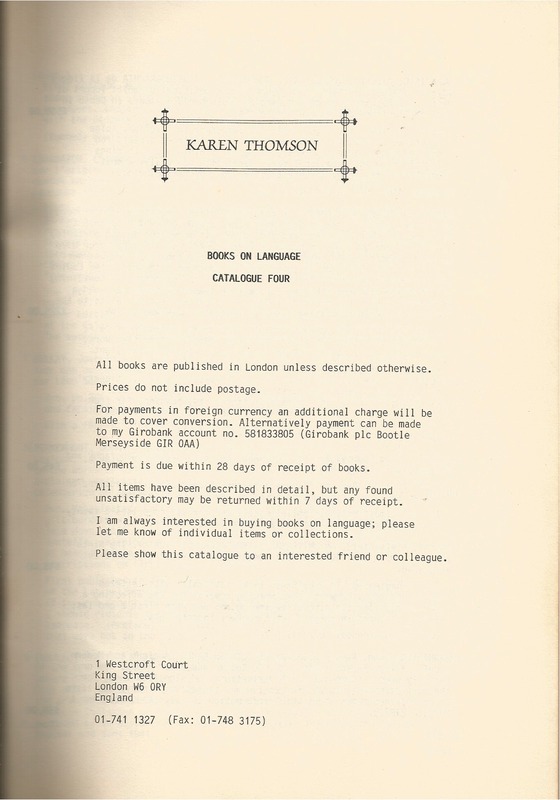 You will read more about Karen Thomson's catalogues of Books on Language in my October post to My Sentimental Library blog. I have over sixty of her catalogues. 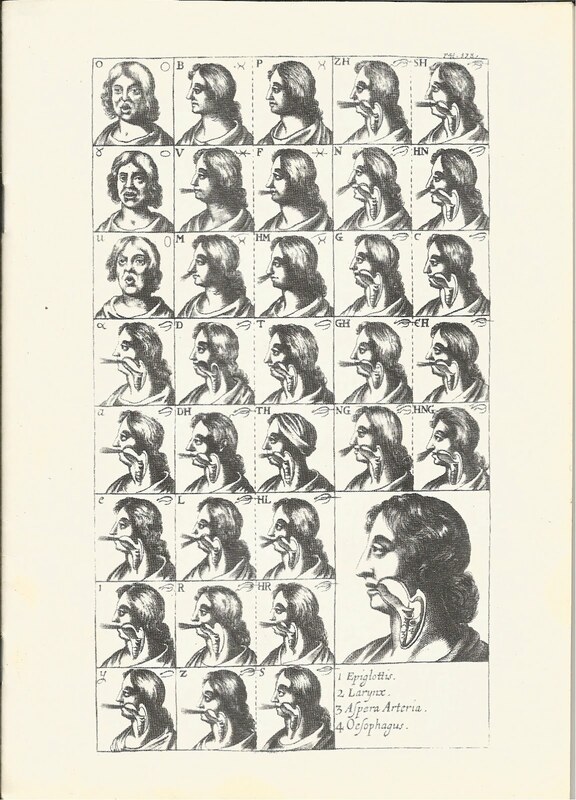 The engraving appeared to illustrate how vowels and consonants were spoken. 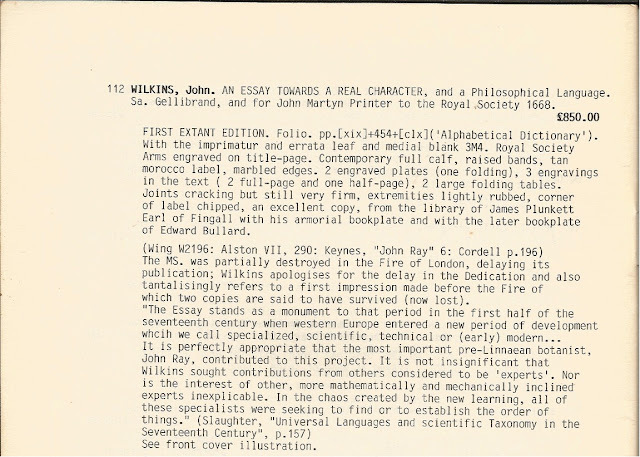 But I wanted to know more so I viewed Wilkin's work online via Early English Books Online (EEBO). Rather interesting, it is. 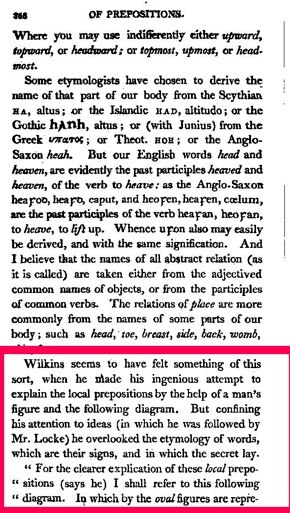 Wilkins was attempting to make English the universal language, replacing Latin. So much for Kneass designing the engraving in The Diversions of Purley! I don't know what they call it in engraving circles, but in writing circles we call it plagiarism. Granted, Kneass changed the man's clothes and even had the man's hand pointing straight instead of up, but everything else in the diagram is the same. The 1668 engraving is not signed, but John Wilkins was an engraver, and may have designed and engraved this illustration himself. Researching further –– something I failed to do before praising Kneass –– I notice that Wilkins, his figure of a man, and the phrase,"the following diagram," are mentioned in the chapter on prepositions in the 1806 First American Edition of The Diversions of Purley. 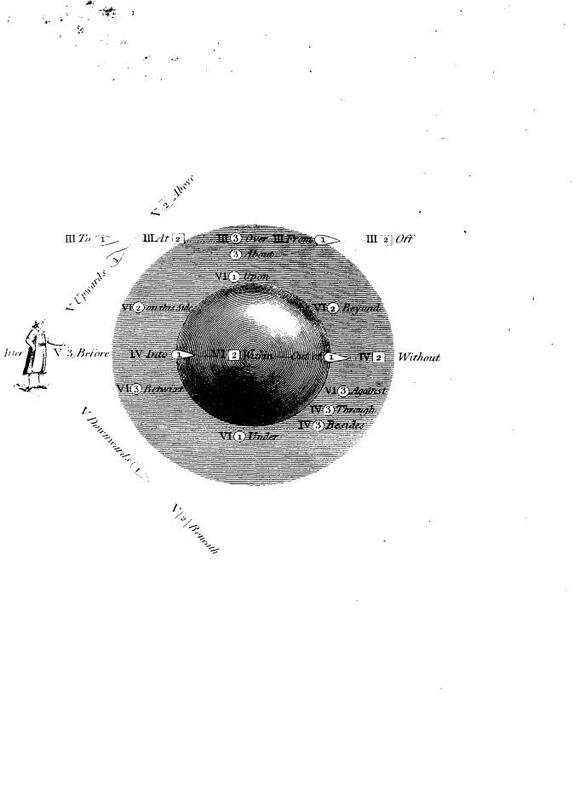 But the diagram isn't in the chapter on prepositions; it is the frontispiece of the book. Notice anything different in the engravings? 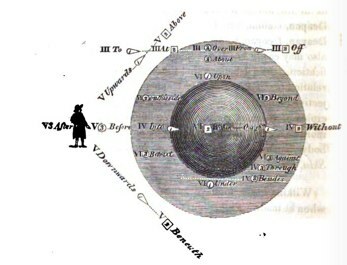 The man's hand is pointing in a different direction in each engraving: pointing up in the 1786 edition; pointing straight in the 1798 edition; and pointing down in the 1840 edition. The man's hand is pointing down in the 1840 and 1857 London editions as well. 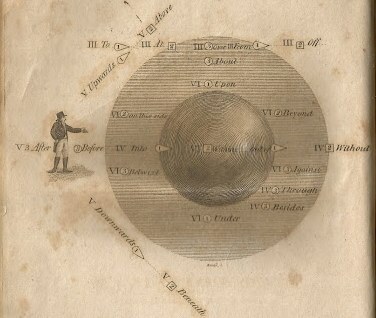 As mentioned before, the man's hand is pointing straight out in the frontispiece of the 1806 edition engraved by Kneass. Where there's smoke, there's fire, so I began to wonder if there was a little hanky panky going on with the frontispiece for Vol 2 of the First American Edition of The Diversions of Purley as well. 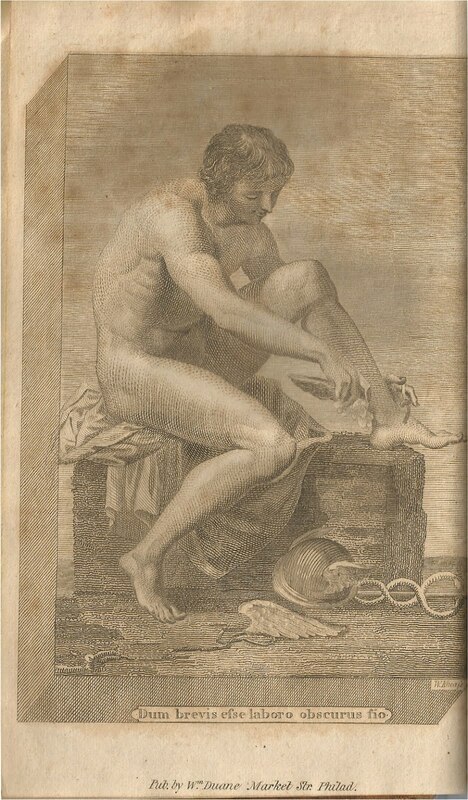 William Kneass was also the engraver of the frontispiece of this volume, showing Mercury putting on his winged sandals. Kneass signed this engraving "W Kneass sc." 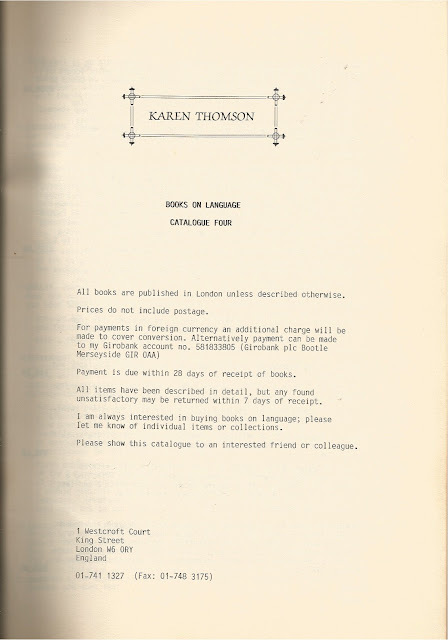 I checked the frontispieces of the London editions online. 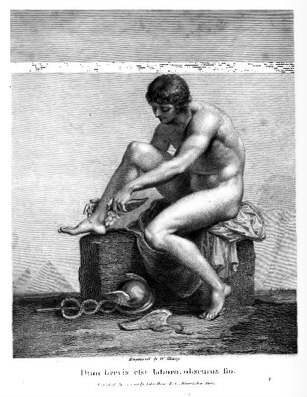 There was no frontispiece in the 1786 edition, but Horne Tooke hired William Sharp (1749-1824) to design the engraving for the frontispiece of the 1798 edition: Mercury putting on his winged sandals. Sharp's engraving was used on all subsequent London editions. Kneass merely reversed the engraving, and had Mercury putting the winged sandal on his left foot instead of his right foot. Clever eh? Not. I should mention the following information concerning William Sharp which appeared in the Annual Biography and Obituary for the Year 1825:"He engraved the figure of Mercury putting on his sandal wings after a model or drawing by Banks for The Diversions of Purley (P225)." Banks would be Thomas Banks (1735-1805),Britain's first modern sculptor. I could find no recorded sculpture of Mercury putting on sandals by Banks. It may have been one of the models or drawings he created while still a student. 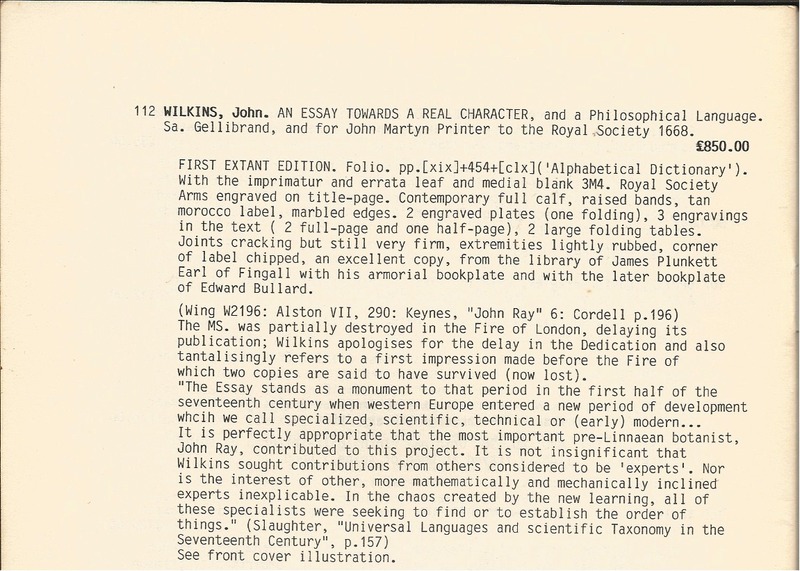 At any rate, in regards to Sharp's engraving, I am pleased with the phrase "after a model or drawing by Banks." Too bad William Kneass didn't use such a phrase.